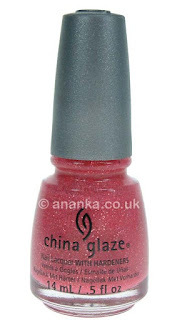 Posh Polishes: China Glaze Shell We Dance? China Glaze Shell We Dance? This is easy to use, easy to apply and quick drying (about 2 minutes a coat). It's a pretty pink textured polish. This one is a tad rough but okay to live with LOL! It lasted really well. Ooh that's really pretty! Is it a new one? I haven't heard of that one. Cool, I'll have to look for those! I love how cool this looks! The color turned out great! Thanks for checking out my blog!! I would love to follow each other! I followed you on gfc and bloglovin, hope you'll do the same!! I love this colour, but unfortunately it doesn't want to match with my skin tone :o(. i love the look of this polish! i don't know if i could deal with rough polishes though i'll probably snag my clothes or something with it... i'm pretty clumsy! Looks really nice on you! I still need to get this polish!!! I have other ones from this collection and I love them! !